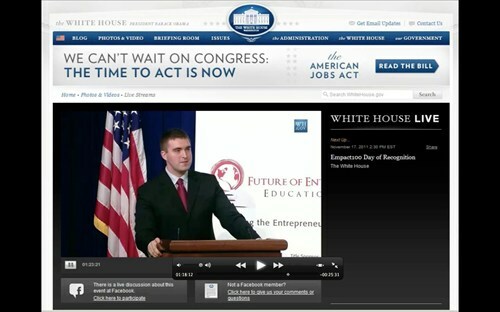 Robby Hill of HillSouth based in Florence, South Carolina has been named to the Empact100 list of the country’s top young entrepreneurs and was recognized in a ceremony at the White House in Washington, D.C. on November 17th. The award winners were selected to be honored for their accomplishments and positive impact on the American economy. 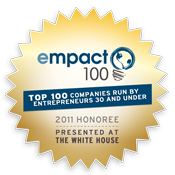 The Empact100 list was created by Empact, in partnership with the Kauffman Foundation, Opportunity International, Global Entrepreneurship Week, and the Startup America Partnership. 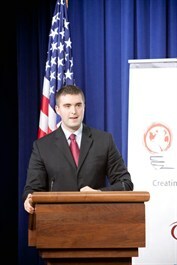 Robby Hill started HillSouth, an information technology consulting services firm, while still in high school at the age of 16. At a very young age he realized a passion for technology, especially Internet and web-based technologies and grew that passion into an enterprise that today creates much needed knowledge worker jobs. HillSouth serves companies, non-profits, and other organizations all over the Southeastern US by providing consulting services in all areas of technology and developing custom applications that meet the needs of an ever-growing base of clients in a wide range of industries. It continues to excel in adapting its business model for new vertical markets – most recently healthcare which has caused the company to grow tremendously while providing new innovative technology solutions for a field in need. Hill stated publicly at the November 17th awards ceremony his intention to mentor future and present young entrepreneurs as well to give his time and resources in fostering the growth of entrpreneurs in the USA and abroad. Currently Mr. Hill serves on the boards of numerous non-profit organizations – including several that deal specifically with younger professionals. His volunteer work and the company’s focus on philanthropy have garnered many other awards over the years and will continue to be a focus of HillSouth in the future. Both the success of HillSouth and the other Empact100 winners are a testament to the impact that young entrepreneurs have on the American economy. The 100 companies on this list are responsible for contributing over 2,500 jobs and over $374 million in revenue. HillSouth was formed in 2001 and is a privately-held technology consulting firm based in Florence, South Carolina. It has experienced professionals focused on delivering business solutions built on a strong technological foundation. HillSouth practices strategic technology consulting services in a wide range of industries all over South Carolina. The company operates a growing business in these key areas: Information Technology (core infrastructure), Healthcare, Application Development, Website Design, and Document Management. 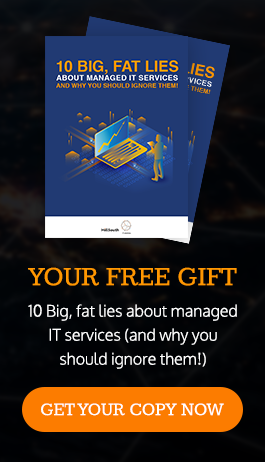 All of its focus areas are growing rapidly; especially the healthcare group which is driving the company’s push into IT managed services. Formerly known as Extreme Entrepreneurship Education, Empact has worked with over 400 colleges & universities, workforce development organizations, Chambers of Commerce, and Small Business Development Centers to help promote entrepreneurship among aspiring entrepreneurs. Empact aims to alleviate mental and financial poverty by empowering individuals to live with passion, purpose, and prosperity through the entrepreneurial spirit. 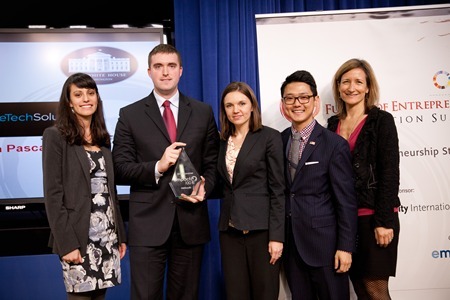 The Startup America Partnership was launched in 2011 at the White House to help inspire and celebrate entrepreneurs, their firms and the people that join them. Founding board members include Steve Case (Founder of AOL), Scott Case (Founding CTO of Priceline), Carl Schramm (CEO of Kauffman Foundation), Fred Smith (Founder of FedEx), Magic Johnson (Founder of Magic Johnson Enterprises), Michael Dell (Founder of Dell), and other notable entrepreneurs.